• STAINLESS STEEL PRODUCTS: All types of stainless steel equipment for use in hospitals, kitchens, hotels & laboratories such as; ranges, canopies, steam tables, work tables, dishwashers, coffee urns, soda fountains, warming closets, drain boards, garbage chutes and incinerators, refrigerators, walk-in coolers and freezers, fume hoods and other incidental equipment used in similar applications. • CABINETS AND CHASSIS: All types of metal stampings and formings fabricated by means of; Fabricators, Power Press Brakes, PEM Insert Machines, NC Machines, Shears, Spot Welders, Time Savers, and TIG & MIG Welders. • BILLBOARDS AND SIGNS: Fabrication and installation of all types of billboards, sheet metal signs and sheet metal marquees used in connection with display windows, store fronts, building fronts and theatre fronts as well as for advertising and display purposes. • AIR HANDLING EQUIPMENT: Manufacture a variety of products and equipment used in the air handling industry such as; fans, ventilators, hoods grilles, diffusers, registers, cabinets, air washers, filters, louvres, dampers, air conditioning chambers, VAV boxes, unit heaters, solar energy systems etc. • ROOFING, SIDING, PANELING AND VARIOUS OTHER PRODUCTS: Manufacture of all types of pre-formed panels or sheets such as; metal roofs, siding, gutters, downspouts, scuppers, cupolas, weather vanes, shower enclosures, pre-fabricated fireplaces, kitchen hoods, and bathroom vents. As well as lockers, toilet partitions, coils, aluminum boats, lighting fixtures, switch boxes, cut-out boxes, panel boards, pre-formed ceiling panels and track. Production workers are highly skilled factory workers who must fabricate metal products to precise specifications. They include assemblers, welders, brake operators and polishers. They also include other positions that are associated with the fabrication of sheet metal products, such as shipper/receivers and helpers. Workers in the production sector fabricate a variety of metal products, primarily for installation on construction projects. Production items are typically catalogue products that are not custom-made for a particular construction project. 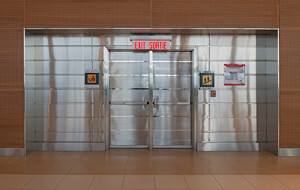 They include products such as fire dampers, smoke dampers, louvers and VAV boxes.